September was for us a month with 3 events. A busy time, sodirectly after the holidays. It all worked out perfectly and again we saw a a lot of known and new people. In october there will be 2 events: the Noaberevent (at 10-10-10) and the Snert event on october the 24th. We are looking looking forward to it. If you are looking for specific products, please let us know so that we can bring it with us. In the meantime, we are working hard to extend our portfolio again. 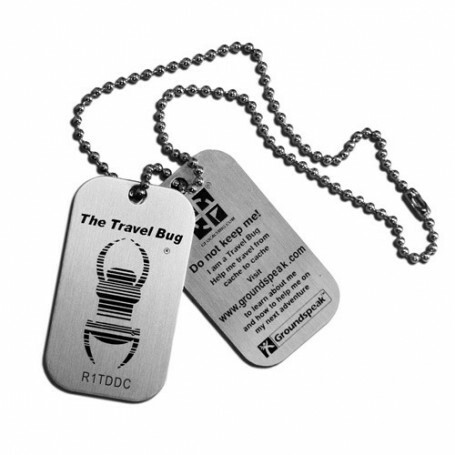 Of course a number of new Geocoins, but brandnew are the Travelbug tattoos. 5 tattoos + travelbug set to make your flashy entry at an event! Doesn't this just sum up geocachers sometimes? It takes a certain kind of person to jump down a rabbit hole, or bushwack through a patch of brambles. The VOC Geocoin is made in the remembrance of the Vereenigde Oostindische Compagny (Dutch East India Company). The front of the coin is an exact copy of a medaillion that was given to Adriaan Bergsma in 1740 as commander of the returning fleet of the Vereenigde Oostindische Compagnie. On the back is the well known logo of the VOC. With an orange V, a white O and a blue C.
This is a very biker themed coin, definitely a must for all those who love to cache by motorcycle. This weighty coin comes with a pathtag with its own unique number, and a cool, custom patch! Nieuw: tattoos with a real travelbug number with the text 'Discover me ..... if you can'. To make yourself trackable at an event! In the package, there are 5 tattoos + a complete set travelbugs, all with the same tracking number. This unique tag is just over an inch in diameter and celebrates 100 years of scouting and 10 years of geocaching. Two sizes for perfect storage of your Geocoins. The red box is for microcoins and coins till 38 mm (pouches till ~ 5 x 5 cm). The white boxes witte doosje is voor are for 44 mm coins (pouches till ~ tot 6,5 x 6,5 cm). Heavy-duty non-rusting, jumbo size plastic box measuring appr 10 x 5 cm. The dual magnetic system is made to hold. Inside dimensions are 8 x 3,7 cm. Very well known for making great geocaching containers in awkward places! It already has a Geocache sticker on the front and the Geocaching logo on the back. … do you think today there is another surprise in the box? But, how did you open it again? Since this box is not waterproof we recommend to hide it in another watertight box for instance our Cryo-Tube.